Cellulite is an irregular change in the structure of your skin, also involving changes in the fatty layers under your skin, which result in a dimpled orange peel or cottage cheese appearance. Problems occur mostly on the buttocks or thighs, and can also appear in the abdominal or pelv ic regions. Onset for women is any time after puberty, with the tendency to worsen as one grows older. Onset for men is typically after age 40, when androgen levels begin to decline. Your skin and fat beneath your skin are composed of various layers; it is important to understand these in order to understand cellulite. The epidermis is the outer layer of your skin, providing a protective barrier. It is made mostly of keratinocytes; skin cells that are stacked on top of each other to form the barrier. It also contains skin pigmenting cells (melanocytes) and immune cells (dendritic cells); important parts of the protective barrier. The epidermis is not significantly involved in cellulite. Below the epidermis is the thicker skin layer called the dermis. It is a much more alive and metabolically active skin layer, containing nerve endings and blood vessels tiny pipes that supply nutrition and oxygen to the skin and help carry away waste products. It is made mostly of connective tissue (collagen, elastic, and reticular fibers). There are a lot of fibroblasts in this layer of skin (carpenter cells that synthesize new connective tissue). It also has the oil glands, sweat glands, and hair follicles. The healthy structure of the dermis is disrupted when there is cellulite. The first layer of fat under the dermis and in contact with the dermis is called the areolar layer. I call it the insulation layer, which is its main purpose. It has a profound effect on how your skin looks. It is made of large fat cells that are stacked vertically into tightly packed groups. Each group of fat cells has its own blood supply, which is very fragile (as in bruising and spider veins), and is surrounded by connective tissue. There are also fibroblasts to make new connective tissue and macrophages (immune cells) residing with the fat cells. The healthy function of this first layer of fat is significantly disturbed when there is cellulite. The dermis and insulation layer of fat are the primary areas of problem as far as cellulite is concerned. Between this insulating layer of fat and your muscles is another layer of fat that exists primarily to provide cushioning (lamellar layer). The fat cells are smaller (if normal weight) and arranged horizontally. The blood vessels are stronger and once again fat cell groups are surrounded by connective tissue. This layer of fat can become part of the cellulite issue if you are overweight, as the fat cells expand in size and put pressure on the dermis and insulation layer of fat aggravating whatever problems they may be having. These two layers of fat are often referred to as one layer by the name subcutaneous fat. 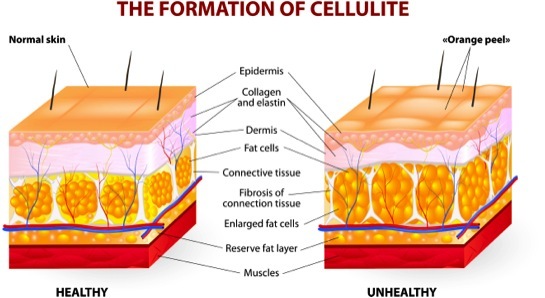 However, for an understanding of cellulite it is important to recognize there are two specific layers of different kinds of fat structures in the subcutaneous fat. The connective tissues loosely attach your skin and fat layers to your muscles allowing movement of your skin while holding your body together. The first changes that result in cellulite are not visible to your eye. They begin with changes in the circulatory system; i.e., blood vessels become more permeable due to some form of stress. This causes fluid to accumulate and pressure to build in the dermis and fat insulation layer. The resulting inflammation and free radicals damage the connective tissue that is holding the fat cells in proper alignment. Estrogen then locks the problem into place and it becomes self perpetuating with visible signs now showing up. In response to the damaged connective tissue fibroblasts try to make new collagen to repair the problem. However, the fat cells that the connective tissue is surrounding have been knocked into an irregular pattern so that the new connective tissue does not form properly. Instead, there is a build up of irregular connective tissue which locks the now swollen and inflamed fat into a rigid and irregular nodule visual cellulite. If the problem gets worse the connective tissue begins to form scar-like abnormal structures wherein smaller nodules clump together into larger ones advanced cellulite. Various forms of stress start this process in the first place and lend a hand in perpetuating it. Poor diet (snacking, as well as too much fat and sugar), smoking (shuts down circulation to the skin), emotional stress (inflames the circulation and nerve endings), a sedentary lifestyle (lack of muscle fitness and lymph movement), constipation and/or wearing painful high heel shoes (which reduces lymph and blood flow out of the legs), and obesity (which adds insult to injury) are all factors that set the stage for cellulite and help lock it into place. Pregnancy places significant circulatory and lymph stress on the legs and is often the triggering event that starts cellulite going. Unfortunately, once cellulite is in motion it tends to be self perpetuating with no quick fix. The problem can be stopped from the inside out, and repaired at least to some extent, and doing so is likely to provide an improvement in appearance as well as other significant health benefits. There is no quick fix, but progress can be made when various health issues are improved consistently and simultaneously over time. Onset of cellulite in women can occur anytime after puberty, as estrogen levels rise. Higher levels of estrogen act in multiple ways to help start and perpetuate cellulite. In the formative stages of cellulite your body attempts to repair connective tissue damage by making more connective tissue. This does not work so well because pressure problems, fluid problems, inflammation, and free radicals have weakened the existing connective tissue structure to the point that fat cells have slipped out of alignment and taken up irregular shapes due to all the various stressors on them. This means the new connective tissue goes around the problem as opposed to being able to fix the problem. Fibroblasts in the dermis and insulation layer of fat are trying to make the new connective tissue and the rate these fibroblasts operate is controlled by estrogen (estrogen activates the enzyme adenyl cyclase, turning on the cyclic nucleotides that activate fibroblasts). The improperly formed new connective tissue actually attracts more water causing an increase in pressure and a lack of oxygen in the skin, resulting in further damage (tissue hypoxia) and an even increased attempt to make more connective tissue that isnt working right. Estrogen also acts to swell the size of the fat cells, helping to form larger irregular shapes of fat cells. If a woman is overweight the extra fat cells in the deeper layer of fat not only push pressure outwards and infiltrate the insulation layer of fat, they also synthesize more estrogen, aggravating the issues explained above. Estrogen itself then stimulates the storage of more fat, expanding fat cell size, and increasing pressure on the problem areas that result in cellulite. Many women have high estrogen menstrual cycles, relative to low progesterone. Such women have PMS, menstrual headaches, breast swelling and tenderness, and heavier menstrual cycles. Even in the absence of such classic high estrogen symptoms, excess stress will deplete progesterone and leave a woman exposed to higher estrogen. All these factors, especially if combined with obesity, fuel the estrogen problem that causes cellulite. Many women notice that cellulite appearance worsens and subsides in response to the fluctuating estrogen levels of their menstrual cycle. Smoothing out excessive estrogen or excessive fluctuations in monthly estrogen patterns is vital to preventing or improving cellulite. Birth control pills, which are a steady state of estrogen, can cause cellulite. Women approaching menopause typically have higher estrogen levels (heavier periods) before they lighten and go away another period of a few years when cellulite may really flare up. Estrogen replacement therapy can cause cellulite. Any woman gaining weight while taking any form of estrogen is at risk for an increase in cellulite. Testosterone levels in men, which usually support muscle strength, less body fat than women, and better fat burning tend to protect men from cellulite. This natural protection declines after age 40 as androgens decline, opening the door for cellulite to form. Thyroid problems aggravate the cellulite issue. Hypothyroid results in poor energy status and thus a reduced ability of circulation, lymph, and fatty acid metabolism to work properly playing into the stagnation aspect of the cellulite issue. Hyperthyroid speeds up the estrogen-driven faulty formation of new tissues provoking fluid retention under the skin, also making cellulite worse.